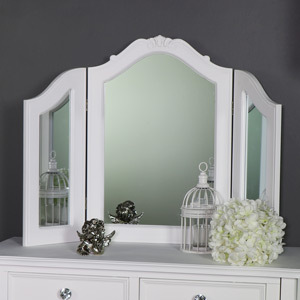 If you love vintage, shabby chic and ornate French inspired painted furniture, you will love the Elise White range! The Elise White range is a gorgeous collection of white painted bedroom furniture designed in a French, shabby chic style. The Elise White range comes with ornate detailing on each piece, vintage inspired feet detailing and glamourous crystal style handles. The Elise white range is one of our most extensive furniture collections with items designed for bedroom, living room, hallway, study and dining room use. The Elise white range is the perfect bedroom furniture collection for anyone wanting to recreate some classic Parisian elegance or their own shabby chic paradise. 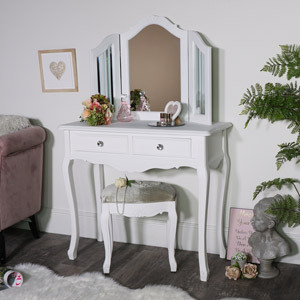 The Elise White range includes a fabulous vintage style dressing table set that includes mirror and stool, a variety of different chest of drawers and cupboard design, a choice of bedside and side tables as well as a large selection of storage and display cabinets. View the full Elise White collection to see what’s on offer and design your ideal French inspired home!